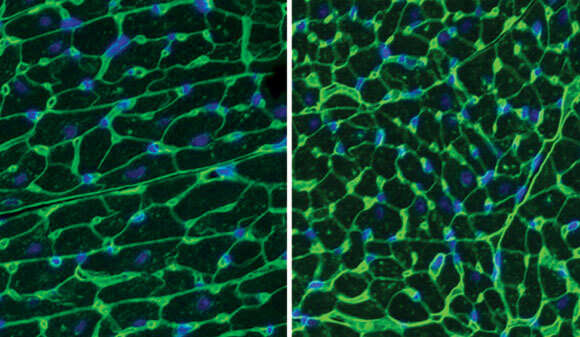 Low-dose dasatinib improves heart function in Noonan syndrome: left image shows untreated left ventricle (D61G/+ , vehicle) versus treated (D61G/+, dasatinib). New research shows that a low-dose of the FDA-approved drug dasatinib improves heart function in Noonan syndrome. About 1 in 2,500 babies born in the United States each year have Noonan syndrome (NS), a genetic disorder that results in severe heart defects, among other symptoms. A mutation in a gene called PTPN11 which encodes for the tyrosine phosphatase Shp2, causes the condition. To identify a potential target for therapy, a team of Yale researchers studied mouse models of the disease. Led by professor of pharmacology and of comparative medicine Anton Bennett, the team focused on a protein called PZR, which was first identified by them to be altered in the hearts of NS mice. They found that PZR interacted abnormally with a mutated form of an enzyme, Shp2, in two different models of NS. After discovering how PZR interacted abnormally with Shp2 in the hearts of NS mice, the researchers then used an existing chemotherapy drug, dasatinib, to target the interaction. “We identified an FDA-approved drug that at much lower doses is effective in restoring the cardiac function of both mouse models of NS,” said Bennett. The study result suggests that dasatinib and similar drugs at low doses could be effective treatment for NS-related cardiovascular defects and should be considered for clinical trials. Read the full study, published in JCI Insight (Low-dose dasatinib rescues cardiac function in Noonan syndrome). Be the first to comment on "FDA-Approved Drug Treats a Rare Cardiac Disease"